Until now, transferring files from Adobe Premiere or After Effects into Avid Interplay required time-consuming extra steps including manual file manipulation and transcoding – mixed with a dash of alchemy and prayer. DiaQuest ProductionLink for Adobe Premiere Pro and ProductionLink for Adobe After Effects eliminates all this overhead and creates an easy-to-use, compatible, and reliable conduit between these systems. The DiaQuest ProductionLink for Adobe plug-ins are fully compliant with Avid file formatting and folder organization. This means that once saved, files are immediately available to other Avid applications like Media Composer™. You can reliably and easily transfer content between Adobe and Avid systems because what used to take multiple manual steps becomes a single command. In a busy facility, this can save time and money, plus editors get more creative work done and spend less time on file management. ProductionLink exports Avid Mediafiles DNxHD® MXF OP-atom video files and individual PCM MXF OP-atom audio channel files. In addition, you can drag and drop from Interplay Access to Media Composer. ProductionLink for Adobe plug-ins are easy to install and easy to use. There’s no additional hardware required, no server to setup, and no dongles – just a plug-in that installs into Adobe Premiere and After Effects, so there’s no separate application to run. Once installed, ProductionLink for Adobe features appear within the Adobe user interface. When you want to create a file for Avid Interplay, just select that option from the drop down list and all the settings are handled automatically. All that’s left to do is to specify the destination of the files, and that’s done in an intuitive, project-based browser popup. DiaQuest ProductionLink for Adobe Premiere Pro and PoductionLink for After Effects add new levels of flexibility to your workflow by allowing Adobe Creative Suite applications and Avid Interplay to work together. 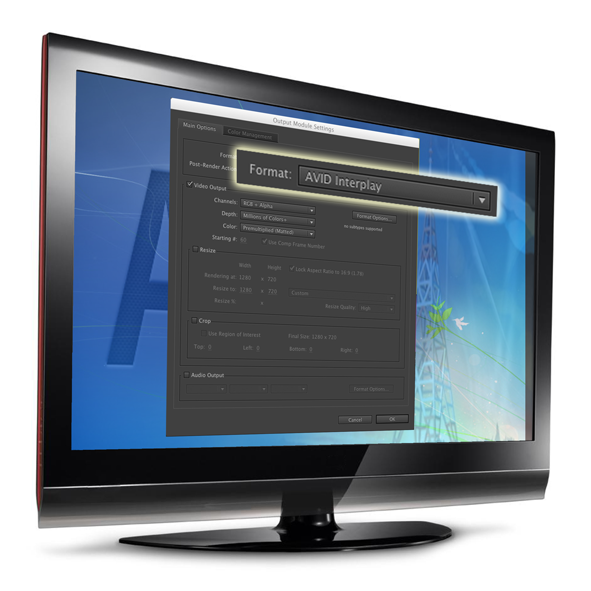 Facilities that have been using Adobe programs can add the file organization and metadata capabilities of Interplay. Workgroups with Avid Interplay can now incorporate Adobe applications into their workflow without adding file conversion and movement complexities. ProductionLink for Adobe plug-ins are available for both Windows and Macintosh systems, so you can get connected regardless of your choice of platform. ProductionLink for Premiere Pro and ProductionLink for After Effects can each be purchased separately. A bundle of both products is also available, along with a four seat pack of the bundled version. Note: You must have Avid Interplay Web Services installed on the Interplay network. See the FAQ.